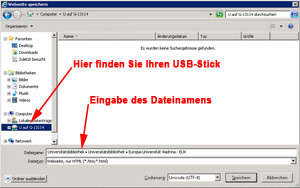 For using your research results on your laptop without delay it is mandatory to save the results to an USB-drive; there is no option for floppies left. Please remember that only those USB-devices will run properly which work without additionate driver-installation. 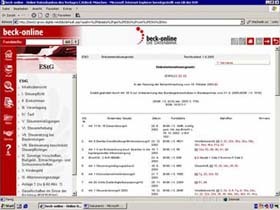 Please find here an exemple for the procedure using the database Beck online. Different databases offer different export-tools. This database is comfortable for printing but requires the “boring” way for saving by manually performed copy and paste. The good news: This works in (nearly) any application. - Inhalt – Gesetze-EStG… Ergebnis..
- Please fit your USB-device into one of the two slots on the lower front of the NC-case. A window will be showing up to confirm that the device has been recognized succesfully. - You may realize that your drive will not be showing up in the Windows Explorer due to security reasons, but under the “saving under” (speichern unter)-menu of the application you will be using for intermediate download; please learn more about that in the following passages. - Please mark your document as far as you like it to be saved and choose “copy” in the browser´s menu or simply Strg+c . - Please open the application you want to use as an intermediate tool from the desktop, in this case Word is the obvious to choose (under MS Office in the Start-Programs-menu). Shut down the NC with the green main button or perform a complete restart of the NC if you may be so kind to prepare the NC for the following user.